One of the highlights of the Nostalgic 2 Days was getting close to so many legendary cars of all types, and on the racing front it was Haruhito Yanagida's Central 20 KY910 Bluebird that really did it for me. The exaggerated bodies of the Super Silhouette race cars from the early eighties are so unique it's always a pleasure being able to check one out in its minutest details and this was one car I had never had the pleasure of seeing before. 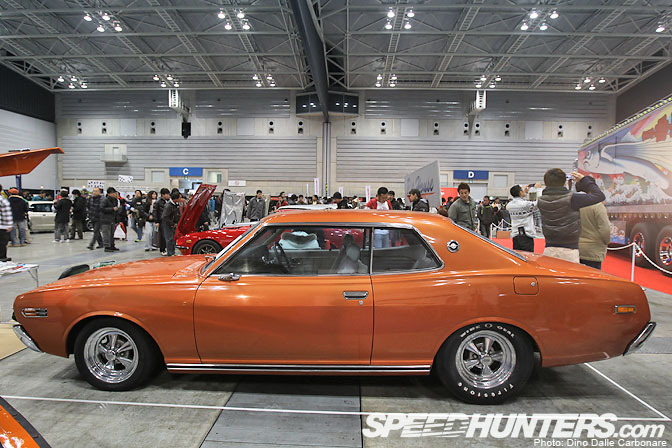 Like the Hasemi DR30 Skyline, it sports a crazy staggered set up with massive 19-inch rear wheels and tiny 16-inch rims up front highlighting that wedge-shaped body even more. This Group 4 racer packed an LZ20B 4-cylinder engine good for 570HP, not too bad considering this particular Bluebird hits the scales at 1000 kg! 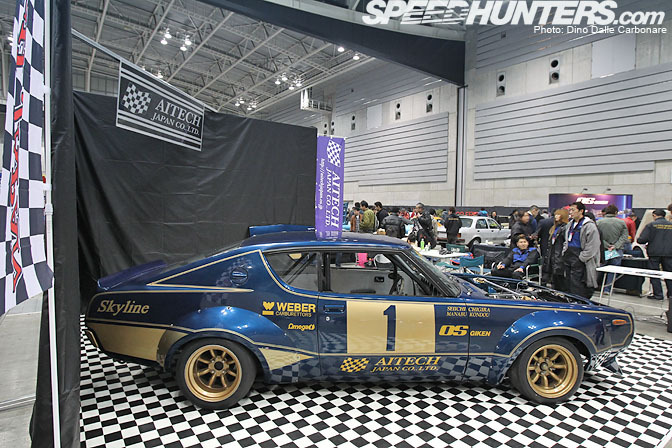 The mix continued from historic race cars to modern-day tuned grip-oriented track specials like this widened S30 from Biko works. The surprises continued for me when I spotted this 1974 Nissan Gloria 230GL 2-door hardtop. 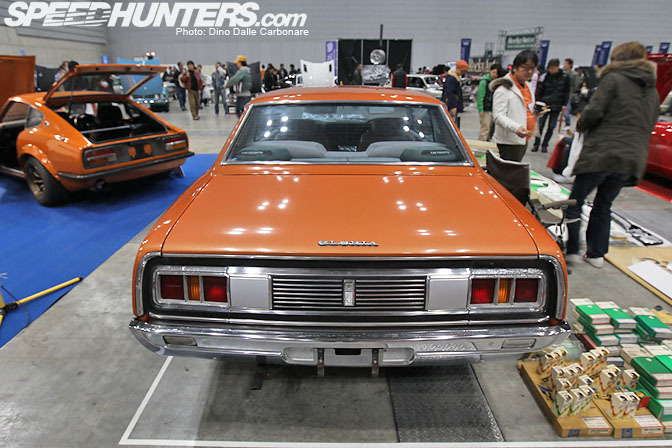 Check out that profile, true seventies Japanese muscle car looks. It's a pretty rare model and holds its value really well in the second hand market. 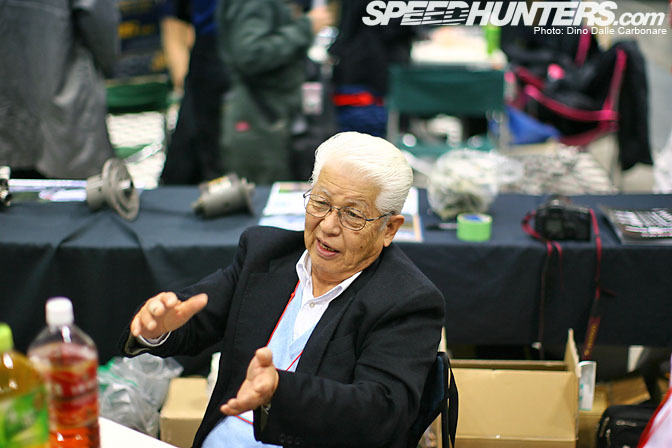 When Watanabe-san from Rocky Auto noticed me looking over the tight fit of the 1UZ in the Hakosuka he built for this year's TAS, he came over and handed me the keys. So with a crowd of about 30 people watching I sparked the smooth Toyota V8 into life and revved it a few times. It was quite weird sitting in a KGC10 and hearing a V8 rumble at each prod of the throttle. Apparently it's very smooth and torquey to drive, something I will be finding out for myself next time I visit their shop!! It was then on to the OS Giken booth…and this is where you will have to bear with me as I have to nerd out big time now. What you see here is a complete L28-based engine that OS Giken will be offering from sometime this year. Based on the old TC24-B1 motor, now renamed TC24-B1Z, it uses an L28 block bored out to 89 mm and a lengthened 86 mm stroke thanks to the fully counter balanced forged crank and H-section connecting rods which boost capacity to 3,208 cc. 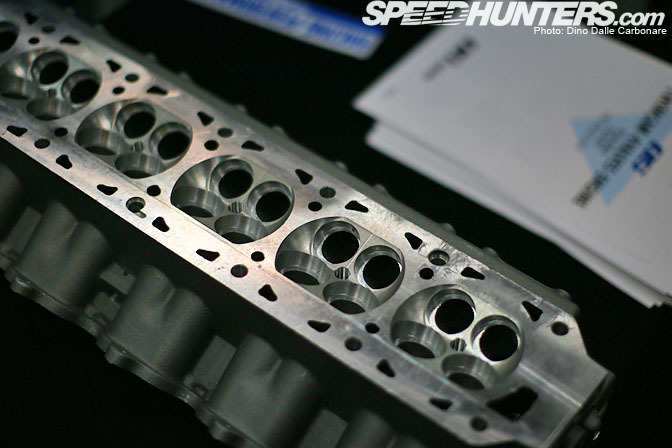 Up top is a completely revised TC24 twin cam 24-valve head. Other cool details include a cam gear timing conversion, which eliminates the L28's chain drive. In fact OS Giken was working on a similar limited edition gear conversion for the Nissan S20 engine a few years back when I dropped by their factory. If you recall I posted a few pictures of it here, as you can see there are no chains to be seen! This conversion eliminates the slack chain-based timing systems have, not to mention the potential for failure which becomes very important if you consider that this L28 engine here revs to 10,000 rpm, 1,000 rpm up from the old engine which was built in 1980. Compression ratio is up from 11:1 to 11.5:1. This display unit was running big Weber carbs with carbon fiber funnels, but sports injection can also be offered. And on to the numbers, this monster kicks out, 420HP at 9,000 rpm and 289 lb/ft of torque at 8,000 rpm. 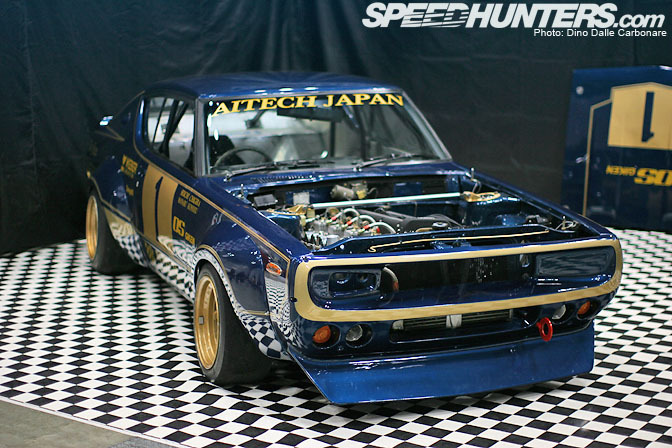 Fit this to an S30, Hakosuka or a KenMary and you have yourself nothing short of JDM vintage perfection! Chatting to Okazaki-san, the president of OS Giken, he was still not sure how many complete engines he will build, nor how many refreshed TC24-B1 he will offer. 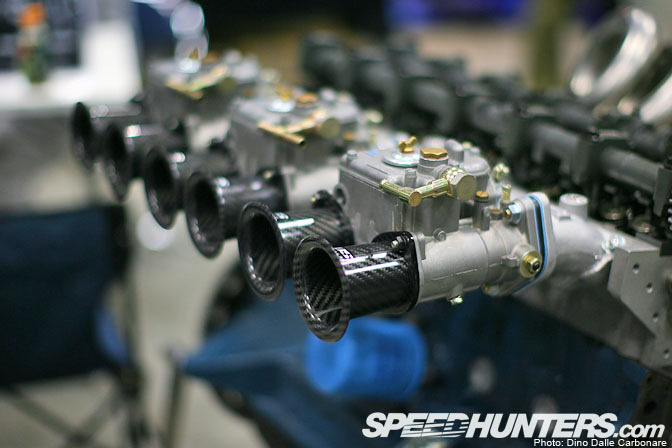 Only 11 head kits were built back in the day so you can imagine why they have become the most sought after L-engine upgrade out there. …and the finished one next to it. 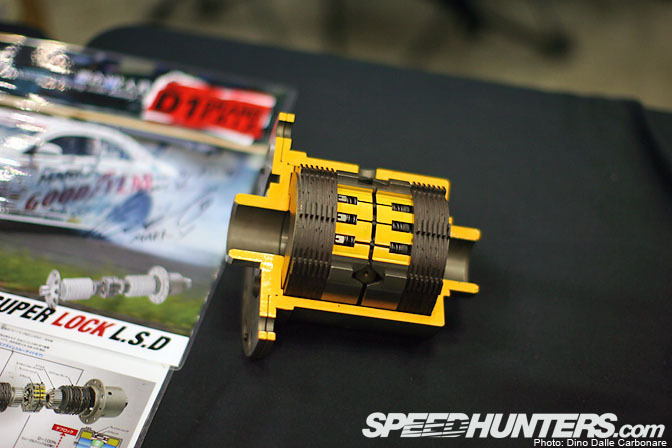 OS Giken also had plenty of other cool products on show like various types of clutch kits and of course the Super Lock LSD. I can't help but post a couple of more shots of the TC24 equipped S30 they had on display. The car has just been built so it wasn't fully set up yet but when they revved it earlier in the day that sound, or symphony rather, blew me away. …fitting a TC24 head conversion on the L28 powering the big Skyline coupe. 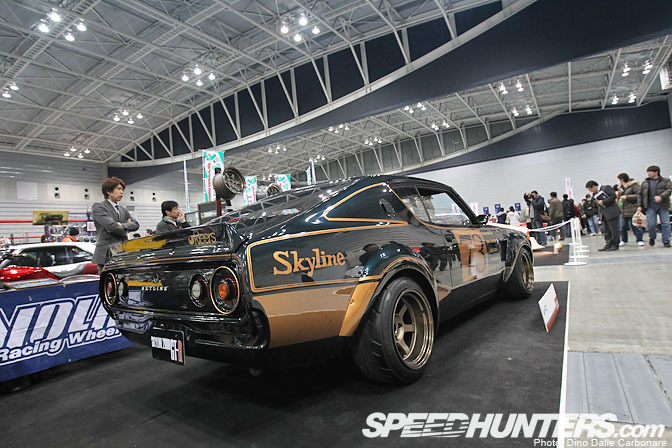 Skyline 2000 GT-R and S20 engine specialists R-Factory came down from Tochigi-ken to show off some of their latest engine parts as well as this race Hakosuka, a car we have seen many times before at the Nismo Festival. 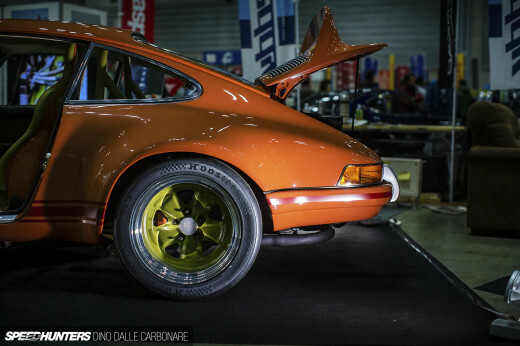 …TE37Vs, where "V" stands for "vintage!" 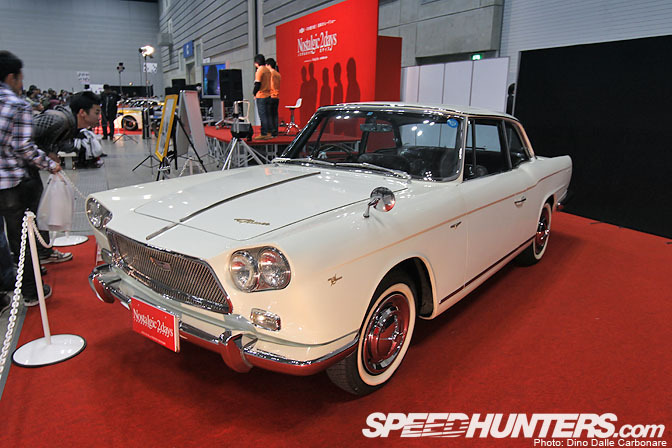 Here is another rare one, a 1964 BLRA-3 Prince Skyline Sports, one of the first three Skyline models that were produced under the Prince brand. 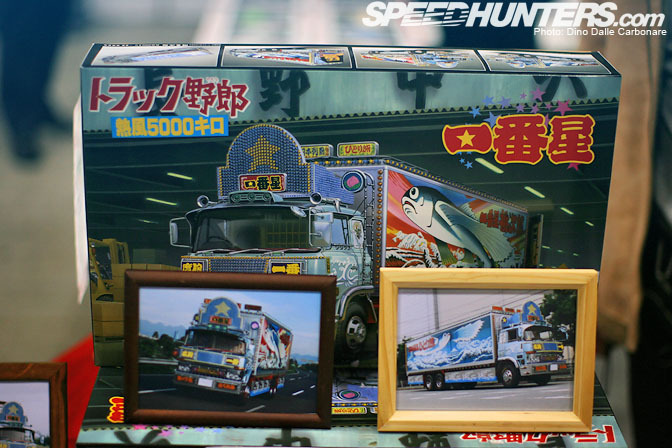 This huge truck was sitting right in the middle of the exhibition hall, a famous vehicle that was used in the very popular seventies movie "Torakku Yaro," which translates as Truck Rascals. 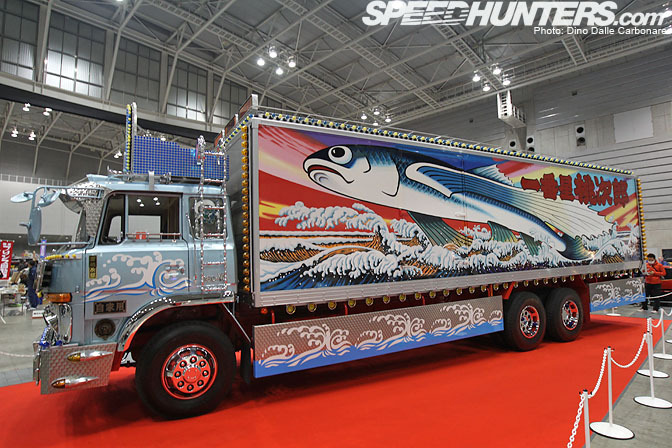 If you ever wondered where the whole dekotora thing comes from then this truck is a pretty good example of how truck drivers began to decorate their trucks with traditional Japanese art, tons of chrome, lights and massive stainless steel bumper extensions. I even spotted a plastic model of it on sale at the Nostalgic Hero booth! 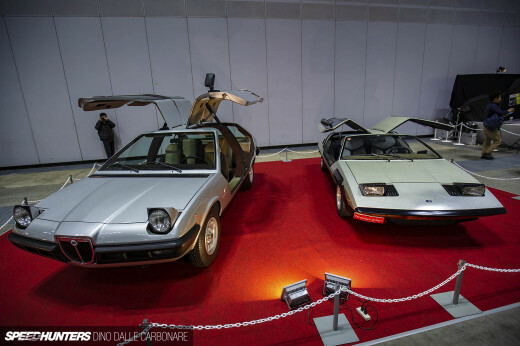 Might not be car related but it's a big part of the whole classic vehicle culture in Japan. Just in case I haven't shown you enough S30s…here is another pristine example from Garage Carry Back. 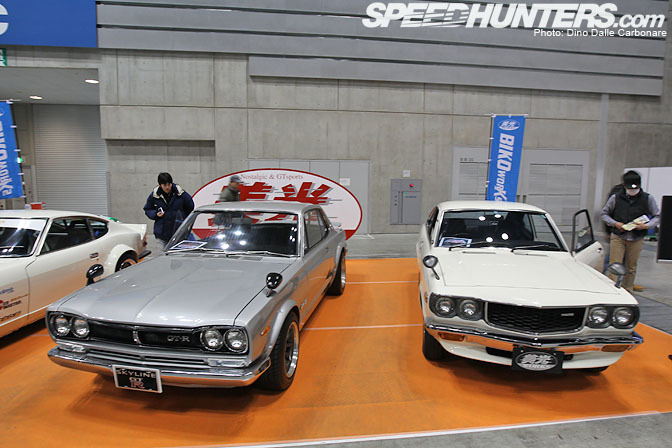 …a Mazda Savanna RE-120 AP, or an RX3 to you and me. 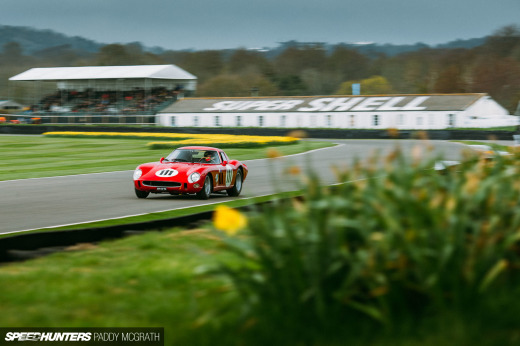 It isn't over yet; I've still got quite a lot to show you from this epic event which incidentally manged to attrack 16,575 visitors over the weekend. Those OS GIKEN engines are pretty sick! Life is not fair!!! I want a TC24-B1 head sooooo baaaaaad!!!!! 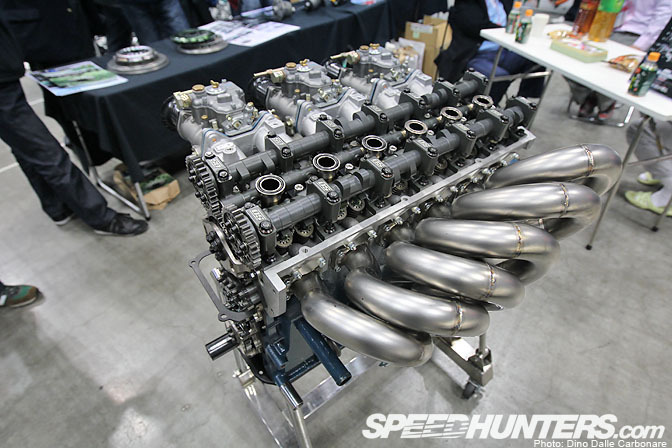 oh damn, i wish i ever see one of these holy grail TC24 Engines in real life. 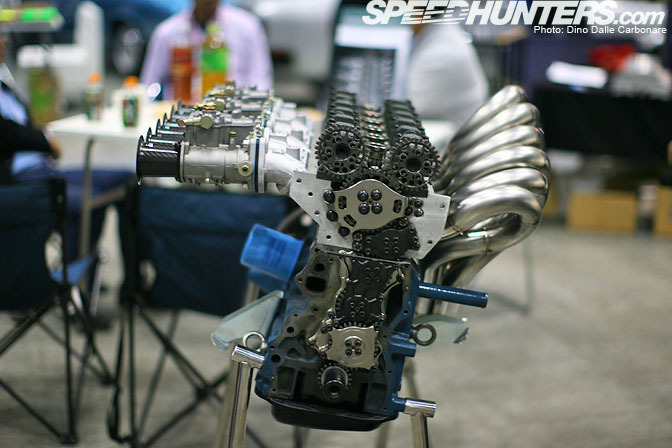 a true piece of art and art of engineering.. so awesome!! Amazing post!! Keep 'em coming ! TC24-B1Z. That is just insane. I love the gear driven timing. That Gloria on cragars is SOOOOO GOOOOD. I want it. 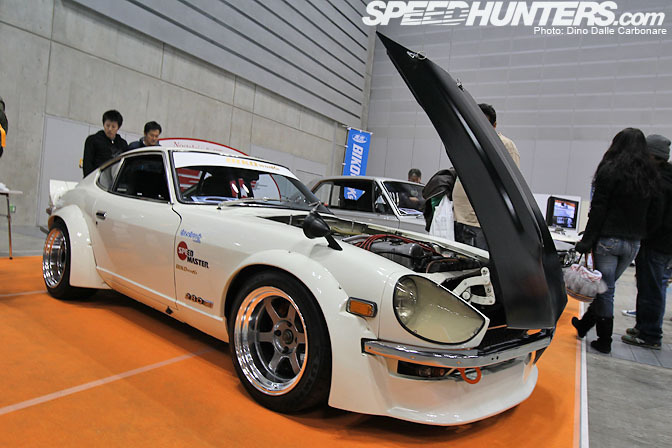 Any chance for more of the flared white S30? 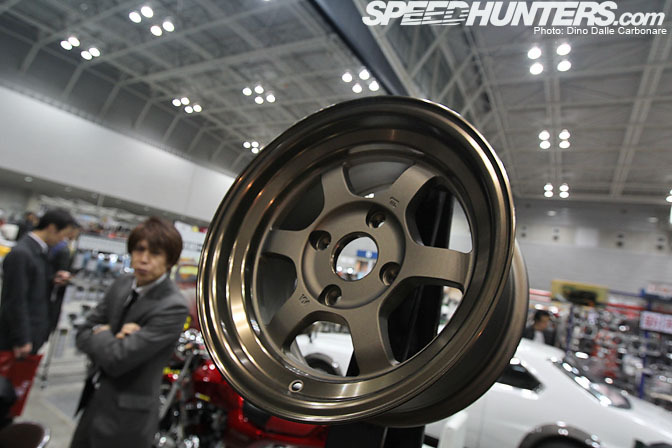 Wow those OS Giken L28's are beautiful, I am now starting to think "Do I really need two kidneys?" 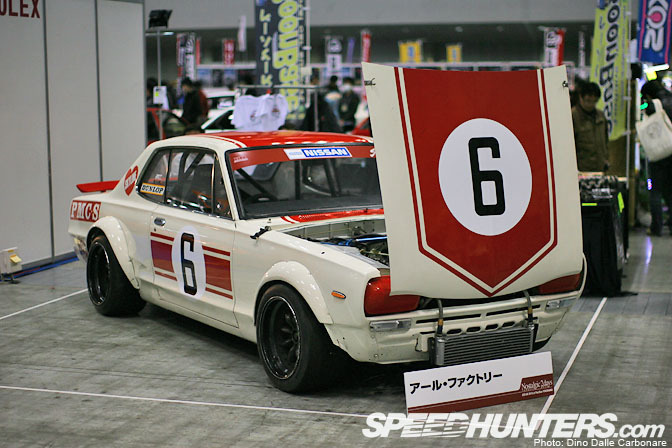 Without a doubt, straight 6 configuration is the best type of engine for Japanese made cars, in my opinion. 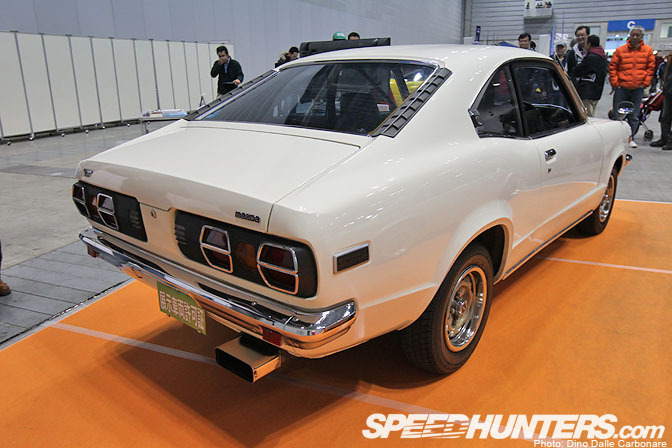 This goes for German cars as well..
any more shots of the Garage Carry Back s30?? 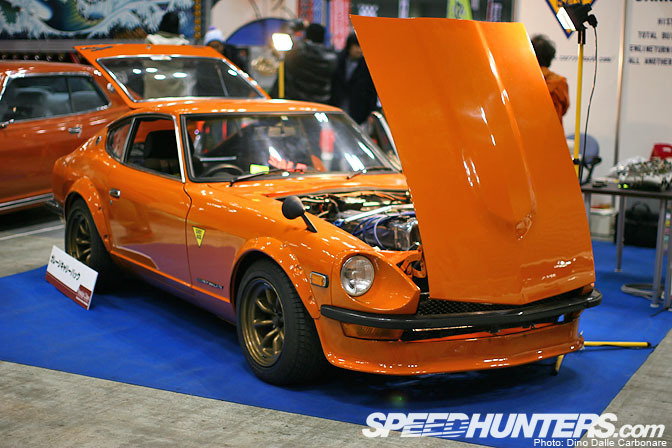 Theres no such thing as too much S30..
where are the Mazda Rxs? It really seems like OS Giken stole the show with those amazing engines! By the way Dino, if you have Isuzus, Mitsubishis or Mazdas, post them please! 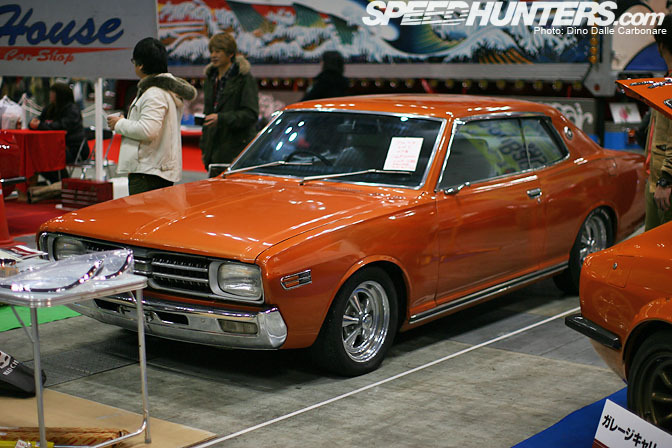 I love old Nissans and L-Series engines, but I want to see other fine Japanese cars too. 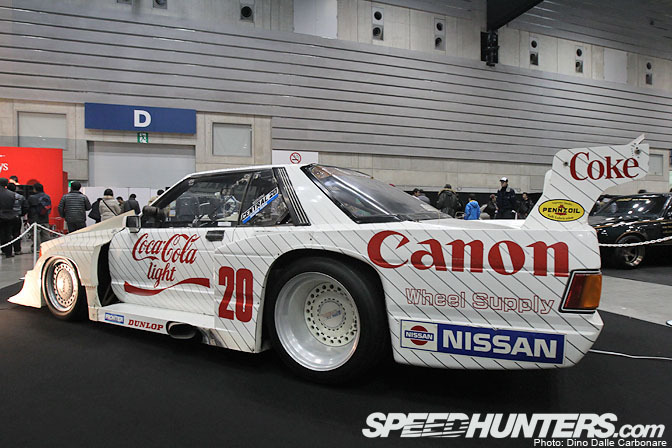 man oh man!, if only OS Giken gave some new lovin' to the L20b, id pick it up the day it came out. 420 hp and 289 lb/ft of torque L-series must sound amazing. Shame on you Dino for no sound clip haha. 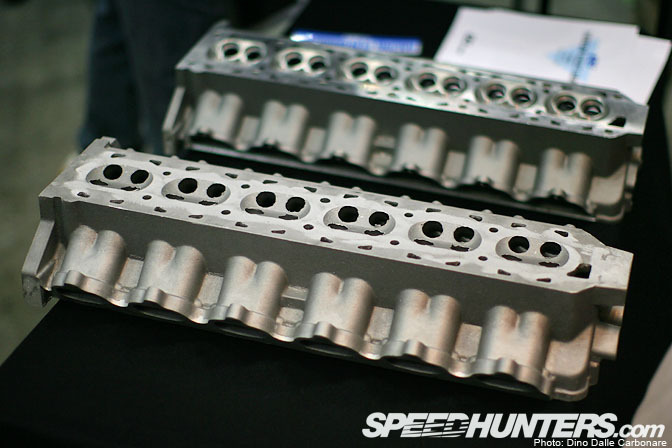 Out rage to put a V8 in a Hakosuka.